Adolf Hitler Facts You Might Not Know About. ~ CK Jacob: Nigerian Fiction And Lifestyle Blog. Adolf Hitler Facts You Might Not Know About. 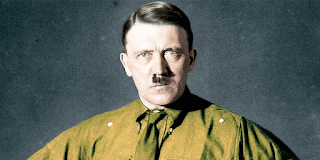 Adolf Hitler from April 20, 1889 to April 30, 1945 was chancellor of Germany from 1933 to 1945, serving as dictator and leader of the Nazi party. He initiated fascist policies that led to World War II and the deaths of at least 11 million people, including the mass murder of an estimated 6 million Jews. Adolf Hitler was an argumentative and questionable personality in history due to his opinions and beliefs and the war he caused. Read some facts about him you might not know about. 1. Hitler adopted the vegetarian diet and stood against the animal cruelty. 2. Hitler was a Disney fan. Snow White and the Seven Dwarfs was his favorite. 3. He had insomnia. He used to work at nights and wake up late in the mornings. 4. He was addicted to chocolate and would consume 1 kilogram of chocolate per day. He was a sweet lover and used to take a daily dose of pastries and cakes. 5. He had a crush on a Jewish girl in his young age named Stefanie Isa. 6. Hitler spent a lot of time with his niece and he had a controversial relationship with her. 7. He lost his one testicle during the World War I. 8. He was fond of art and wanted to become an artist, for this, he applied to the academy of fine arts Vienna twice, but rejected. History: Facts You should know. Watermelon seeds: You can eat it too! Short story: Like A Mouth Full Of Salt.